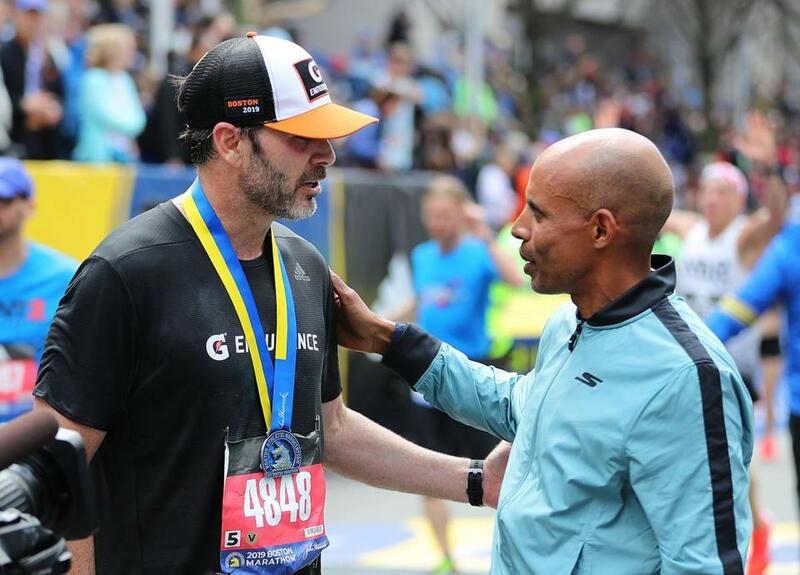 Jimmie Johnson was congratulated by 2014 Boston Marathon winner Meb Keflezighi at the finish line. 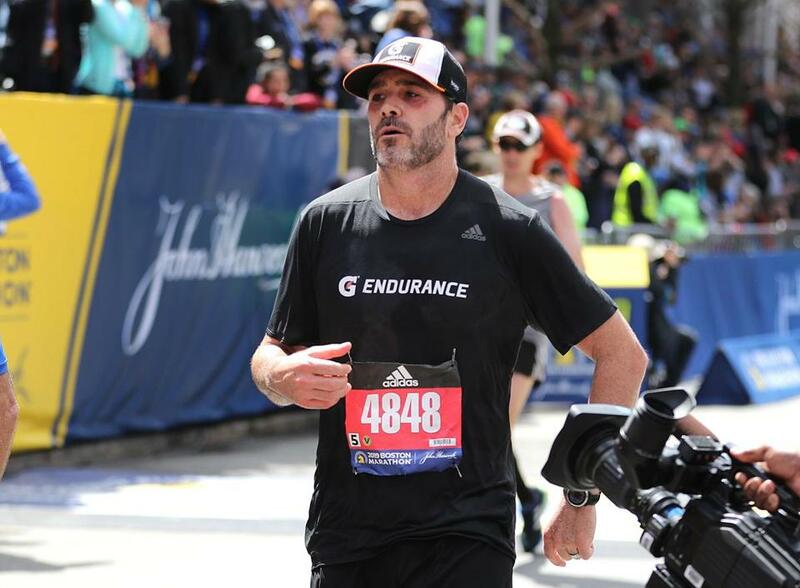 Jimmie Johnson finally accomplished his goal of running the Boston Marathon, but after finishing in 3:09:07 Monday, it did not sound as though the seven-time NASCAR champion was ready to put the race in his rearview mirror. “I understand I qualified for next year’s marathon with that time, in my age group, so I just need to look at the schedule, see if it all lays out, then come back,” said Johnson. It was an impressive debut, especially taking into account he was running his first marathon after competiting Saturday night in the Toyota Owners 400 NASCAR Cup Series race in Richmond, Va., where he started 34th and battled his way through the grid at the three-quarter mile oval to finish 12th in the No. 48 Chevrolet Camaro fielded by Hendrick Motorsports. Johnson, 43, who wore bib No. 4848 in deference to his car number, was pleased with his time. “It’s a [personal record]. It’s my first full, so I’ll take that,” Johnson said with a smile. “I would love to try to break three [hours]. It wasn’t in the cards for today. I left on that number and was trying to hold it and I just didn’t have it. Most marathons take place over the weekend, making the idea of running one nearly impossible for a NASCAR driver. But with the Boston Marathon scheduled for the third Monday of April, Johnson seized on the opportunity when it presented itself. That this year’s race was on the exact date of the sixth anniversary of the Marathon bombing in 2013 made it even more special. Andrew Collier, the brother of Sean Collier, the MIT police officer shot and killed in the bombing aftermath, worked as a machinist in the engine shop at Johnson’s race team, Hendrick Motorsports. “I wanted to come back and run [the year] after the bombing and be a part of it,” Johnson said. “NASCAR’s schedule shifted, so it wasn’t a real option for me. Johnson hits the finish line (without a checkered flag). While he is well known within NASCAR circles, the champion stock car driver expressed surprise at how many people recognized him in Boston, and appreciated the support of the spectators along the route. “That was my big takeaway,” Johnson said. “I couldn’t believe how many people did spot me. It was loud, especially the closer we got to town. That support began as soon as Johnson arrived in Boston on Sunday, when he got to his hotel room and had a signed copy of 2014 Boston winner Meb Keflezighi’s book waiting for him. The two met up Monday, when Keflezighi presented Johnson with his medal for completing the race. “I was like, ‘Wow, that’s really nice. I hope I have a chance to meet him,’ and then he hands me my medal after the race, which is just spectacular,” said Johnson. “He congratulated me and was impressed with my time for a first-time marathoner. Johnson compared the differences racing in Boston’s collegial marathon environment to that of NASCAR’s highly-competitive, “rubbin’-is-racin’” culture. “At the racetrack, there’s 39 other drivers out there, and 39 other fan bases out there, so you don’t always hear cheers,” he said. “Everybody cheered today. Every competitor was offering advice, giving me tips.